Just before noon on 11 September 2008, Diane Marcell returned to her home in Albuquerque, NM, to meet her daughter, Brittani Marcell, for lunch. Brittani, then 17 years old, had driven home from her nearby high school. Upon entering her home, Diane found Brittani lying on the floor, covered in blood. A male subject, unknown to Diane, was standing near Brittani holding a shovel. Startled, he dropped the shovel, ran into the kitchen, and grabbed a kitchen knife, all the while shouting death threats at Diane. She ran outside screaming for help. Instead of pursuing Diane, the subject fled into the interior of the home. Later, investigators found a broken window in the dining area located at the back of the house, through which the perpetrator had exited. They also found drops of blood on the broken glass, presumably from a cut he had sustained in the process. Brittani suffered severe injuries from the attack, including multiple skull fractures, lacerations on her head and face, and a broken arm and wrist. At the hospital, she was reported to be in critical condition, with fixed pupils, minimal brain activity, and a low likelihood of survival. She remained in a coma for several weeks. When she awoke, she had no recollection of the attack. During her long recovery in the years that followed, Brittani required 16 surgeries, including removal of a small portion of her brain, due to it being crushed. Although she eventually relearned how to speak, walk, and eat, Brittani remains blind in her left eye and deaf in her left ear. She also suffered substantial memory loss. Brittani is still unable to recall some of the closest relationships she had at the time of the attack. The Albuquerque Police Department (APD) initially had few leads and little information to go on. DNA extracted from blood found at the crime scene was submitted to the national crime database for comparison, but no matches were found. Diane Marcell described the suspect as Caucasian or Hispanic, approximately 20-30 years old, 5'7" tall, clean shaven, with brown hair. A composite sketch developed with Diane's assistance, which, along with a description of the attacker, was released to the public. The case was featured on America's Most Wanted in 2010, and although over 40 new leads were generated, none panned out. 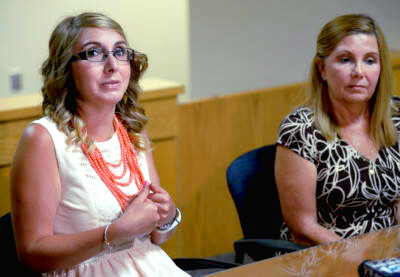 In August 2013, Detective Jodi Gonterman was assigned to Brittani's case. Although Brittani remembered nothing about the attack, she sometimes remembered names from her past she thought might be relevant to the case. With little information with which to prioritize one lead over another, Det. Gonterman painstakingly investigated each new lead in turn, eventually clearing them by one means or another, some by DNA testing. A year after Det. Gonterman began working the case, Britanni began recalling some of the events leading up to her attack, and she eventually came up with a description of the perpetrator, which she passed along to APD. She described the perpetrator as having "very light skin, possibly Mexican or Hispanic male with black spiked hair, square face, big nose, 'weird eyes,' prominent eyebrows, big ears, big forehead, no visible tattoos, muscular but not excessively muscular, and tall." A composite sketch was created from Brittani's description and eventually released to the public. None of the leads generated from the composite led police to the assailant. By mid-2016, well into her third year on the investigation, Det. Gonterman had interviewed countless persons of interest, cleared dozens of people by DNA testing, and she felt she was no further along than when she started. She then learned about Snapshot® DNA Phenotyping and decided it might point her in a useful direction. At least, she thought, it would help her be more efficient. She convinced her department to proceed with the analysis in the fall of 2016, using DNA from the blood sample taken at the Marcell residence. While waiting for her lab to generate a fresh DNA extraction from this sample and for the Snapshot analysis to be completed, Det. 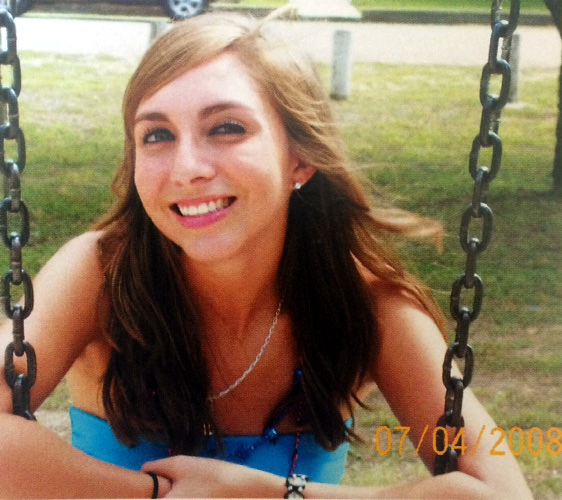 Gonterman continued to collect information from Brittani whenever she remembered events and people from her past. One of the names was, Justin Hansen, a boy she knew who was friends with one of her sisters. Brittani said she thought Hansen visited her at the mall about three to four months before the attack. 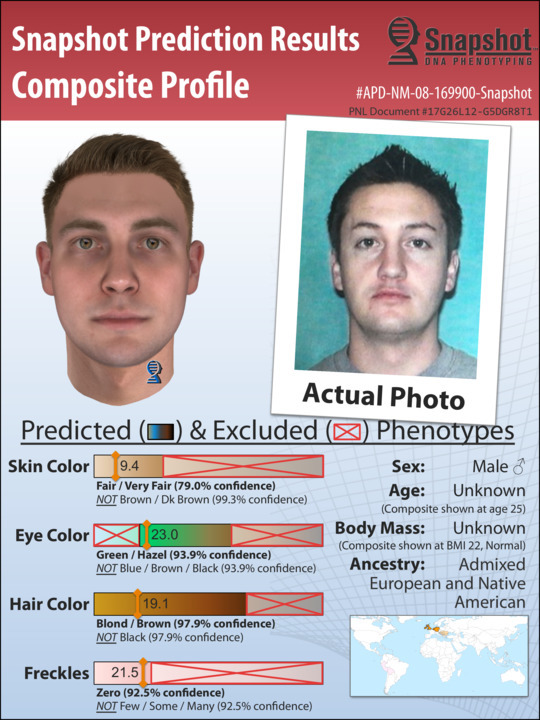 A comparison of the Snapshot Composite Profile and a photo of Justin Hansen provided at the time of his arrest. Upon reviewing Snapshot Report #APD-NM-08169900, Det. Gonterman knew she needed to talk to Hansen. Snapshot predicted the perpetrator was European with minor Native American admixture, fair skinned, with brown hair and green or hazel eyes. Det. Gonterman later reported, "We had one person on the list with brown hair and green eyes, and his name was Justin Hansen. His resemblance to the Snapshot composite could not be ignored." Within days, Gonterman and her partner met Hansen at his residence. Not long into their discussion with Hansen, red flags began to appear, as some of the information he provided was inconsistent with that provided by Brittani's friends. They said Hansen had been hanging out at the sunglass stand where Brittani worked for as much as six months leading up to the attack. Hansen denied the visits, yet Det. Gonterman had a witness who remembered Hansen visiting Brittani on multiple occasions for at least an hour at a time. However, when asked how well he knew Brittani, Hansen said, "Well enough to walk by say, 'Hey, how's it going? How's your family?'" The degree to which Hansen claimed to know Brittani and her sister oscillated during the interview, which gave Det. Gonterman further pause. When asked if he would provide a DNA sample, so that he could be excluded, Hasen demurred. He took Gonterman's number and said he would call her the next day if he decided to give a DNA sample. He did not call. "As a detective, you want to know you're spending your time wisely," said Gonterman afterward. "The consistency of Hansen's appearance with the Snapshot predictions and his behavior during the first interview allowed me to 'lock in'. I knew we needed to learn a lot more about Justin Hansen." Interviews with friends and former associates from Hansen's past indicated he knew Brittani far better than he admitted. She also learned Hansen's phone number was stored on Brittani's phone. Det. Gonterman called Hansen and asked if he had decided whether to give a DNA sample. Again he refused, this time becoming angry, especially because Det. Gonterman had spoken to his family. With approval from the local district attorney, Gonterman eventually arranged for undercover detectives to follow Hansen to obtain an abandoned DNA sample. In time, they were able to observe Hansen drinking from a McDonald's cup and collect it from a trash can. DNA was later extracted from the cup and compared with that from the blood sample found at the crime scene. Through traditional forensic STR comparison, the APD Crime Lab determined the DNA recovered from Justin Hansen's McDonald's cup matched the unknown DNA recovered from the blood at the crime scene. After nearly four years on the case, Det. Gonterman had a DNA match. Recounting her time on the case, she said, "I wish we had used Snapshot much earlier. It would have taken the case in a different direction. We could have bypassed so many people, and saved so much time and money. We could have solved this case a long, long time ago." In early July 2017, Det. Gonterman submitted an arrest warrant affidavit summarizing the incident and her investigation, including the facts and circumstances that led her to believe Justin Hansen was the person associated with the unknown male DNA profile recovered from the crime scene and the person responsible for the aggravated assault and battery of Brittani Marcell. 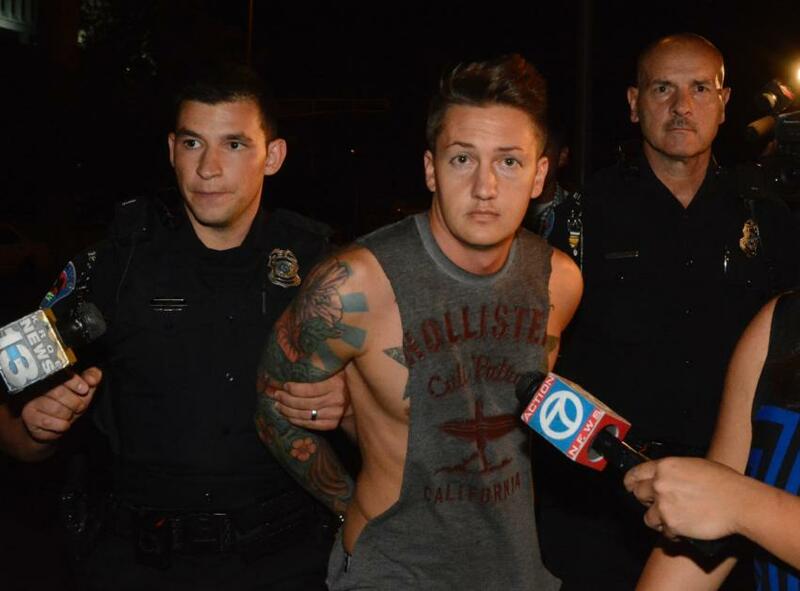 A warrant for the arrest of Justin Hansen was subsequently issued, and APD took him into custody on 5 July 2017. Det. Gonterman is glad to talk with other police agencies about APD's experience with Snapshot, because she feels it's important for others to be cognizant of what DNA phenotyping can do for an investigation. "If you look at all the time we spend chasing false leads and you add it all up, you can see just what an amazing investigative tool Snapshot is. I'm so grateful we could use it in this case." As of September 2017, the case against Justin Hansen for the beating of Brittani Marcell is pending trial.